Honolulu Museum of Art » Great Snakes! Home / Events / Family Sunday presented by Bank of Hawaii Foundation / Great Snakes! Celebrate the year of the sssssnake! Create a paper lotus blossom: It’s easy to make eye-catching lotus blossoms from paper—and they will last a long time. Build a Chinese snake puppet: Turn plastic cups, string, and ribbon into a lively snake! Founded in 1995 with Harry C.Y. Wong as the leader, the group is comprised predominantly of local retired educators. Their repertoire includes traditional and modern Chinese music as well as western music and music of other ethnic groups. Falun Gong, also called Falun Dafa, is an advanced mind-body practice originating in China. The Falun Gong Hawaii group will demonstrate the practice’s two components: five sets of slow-moving exercises and meditation, and spiritual discipline based on the principles of truthfulness, compassion, and tolerance. 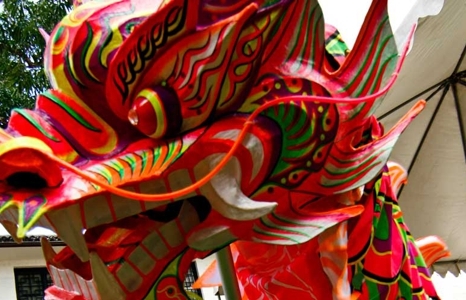 Noon-12:30pm: Lion Dance: Gee Yung Martial Arts, Dragon & Lion Dance Association joins us again this year with a Chinese Lion Dance through the museum starting from Palm Courtyard to bring us all good luck! 2:30-3pm: Phoenix Dance Chamber: See mesmerizing performances of colorful Chinese folk, classical, and modern dance. Chinese calligraphy: See Associated Chinese University Women members practice the art of Chinese calligraphy. The members will write auspicious words and sayings on red paper to give to visitors so they may put it on their front door. Limited quantity, one per family. Chinese knot: A characteristic of Chinese knot is that every knot is made of a single rope and named by its specific form and meaning. See different knots and learn its specific form and meaning. Narcissus plant carving: The art of carving narcissus bulbs is an ancient and honored Chinese tradition. See a demonstration on how to carve a narcissus bulb. Traditional jai: Learn all about the ACUW and jai, a Chinese New Year dish. Take away a free booklet all about jai, including a recipe. Chinese zodiac: Find out your zodiac sign and read your horoscope. Associated Chinese University Women (ACUW) is a non-profit organization working to promote and support the education of Chinese culture. We screen Filling the Gap as a part of the Honolulu African-American Film Festival. 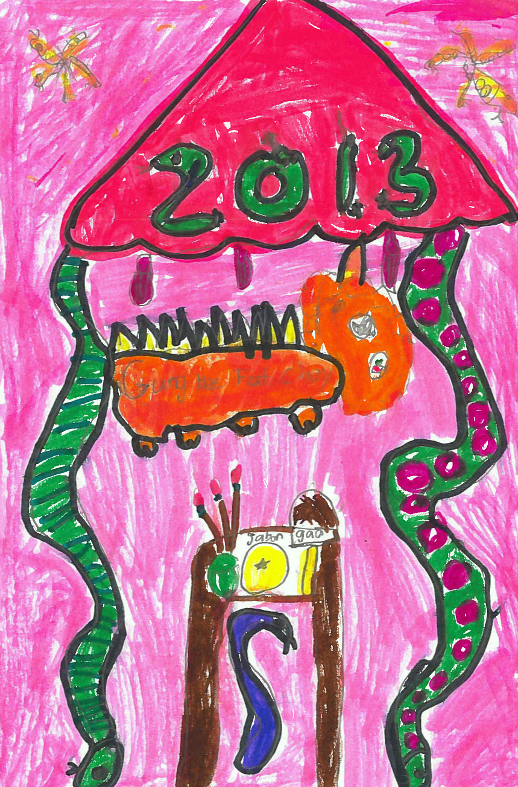 Congratulations to last month's contest winner, seven-year-old Karma Pak Kubo from Honolulu! Kids (ages 1-17) can enter the monthly drawing contest. The Honolulu Museum of Art gives contestants a theme and drawing supplies. The winner receives a Family Level membership to the Honolulu Museum of Art (worth $95), and his or her artwork is used to create the following month’s event brochure and is posted on the Museum's website.